I was passing by a Bobbi Brown booth at MidValley last week when I noticed that the new Ivy League collection was already out here. Surprised me – we don’t always get new collections so quickly. 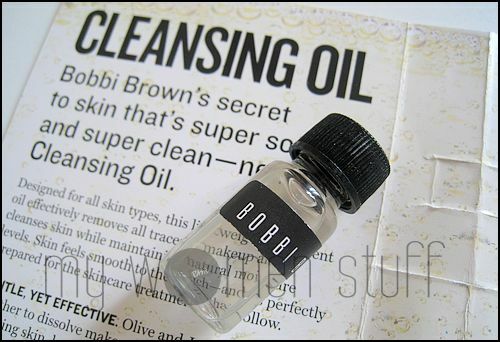 I also got a sample of the new Bobbi Brown cleansing oil which I share some thoughts on below. I was very keen to try out the new Metallic Eyeshadow colour in Bash – a deep emerald green. All 3 new eyeshadows are in the green family – my sorta colour! Unfortunately I was quite disappointed. The texture of Bash the eyeshadow was hard to the touch and it took 3 layers before I got the intensity of colour I expected. If you’re patient and layer and layer, you’ll get a gorgeous deep emerald green with golden shimmer. But if you’re into instant gratification you’d be as disappointed as I was. Ditto the rest of the eye colours – layer 3-4 times and you’ll get the intensity of colour you’d expect from the colour in the pan. Otherwise, its quite sheer. Might work over a base if you’d like to hasten the effect or use a sponge applicator and PAT it on, not swipe it on. Each eyeshadow is RM70. The Lip Crayons have been made permanent. They felt nice going on which was a surprise as I don’t usually like lip pencils. This is a lipstick in pencil form and it does glide on quite nicely. Colours are safely neutral which is classic Bobbi Brown. Needless to say, I walked away without getting anything once again. I think Bobbi Brown just isn’t quite for me… though I keep going back to look time and again. Oh but I did get a tiny sample of the new Bobbi Brown Cleansing Oil to try. I was told the little bottle was enough for 3 uses. However, I was also told that I should use between 3-5 pumps of oil for proper cleansing. Hmm… the bottle contained at most 2 pumps so that’s a bit of contradiction there. Anyway, the Bobbi Brown cleansing oil is mineral oil free and has a very light viscous texture with a light pleasant scent. It cleans my skin well and my skin felt quite nice. I stretched the use from the sample bottle to 2 uses but that was it. No instant breakouts so perhaps it works. Thanks for the Bobbi Brown reviews! This is one collection I’m skipping! Sigh… same and you’re welcome! I using one cleansing oil from ZA. Its in a small grey bottle and each only cost bout 25 i think. I’m on my 2nd bottle ad and i think it does a nice jod for its low price. I like using cleansing oil as there is no need to use separate remover for eyes and face. but whenever I clean my eyes the cleansing oil will get into my eyes and when my tears mix with the oil will cloud my view. do you have any solution to that? but at least cleansing oil does not stink. I never had much luck with Bobbi Brown. Even the palette my mum gave me. All the colours seems so… safe ^^;; Just nice I guess if you are going for that power corporate look in an office downtown. It’s not for me as I’m the kind of person who wears green nail polish with gold glitter to work. Thank God for creative flexibility! Thanks for the review. I’m not a fan of Bobbi Brown, I find all the colors so safe and boring! They are perfect for natural or work friendly looks, but that’s not my thing, I need more color! The price of Bobbi Brown’s cleansing oil is almost the same as Laneige Refreshing Cleansing Oil, which I am currently in love with. I am toying with the idea of switching to BB CO to try after my bottles of Laneige run out, because Pretty Beautiful gave a very good review of it. haha. But with the competition from cheaper alternatives like Fancl MCO, and now, Dove Lathering Oil, I guess this will have to wait. Agree with you that it’s pricey. But I only makeup once a week, so still affordable, since my bottle can last a whole year and more. thanks for your input on the cleansing oil! My I Nuovi one is almost finishing too. guess my next pick won’t be BB! I like the model’s makeup though. I was just wondering if someone could tell me if using a cleansing oil generally will make your face break out? I have always had very clear skin, (dry) and only break out with one or two before my period. I just switched to using the BB cleansing oil, and suddenly I have about 10 or more pimples all over my face! Its very humid here, so I thought that was the culprit, but I am starting to wonder?? I use all BB products for my skin care routine, and nothing of her’s has every broken my face out before….any suggestions?